Hanging baskets and outdoor floral displays can be as much a part of the garden in the run up to Christmas as they were in the long, hot days of summer. While the choice of plants is going to be more limited, there are more than enough varieties to make a good show if you pick them carefully and then look after them properly. 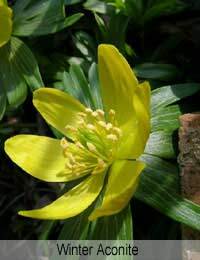 With the rest of the garden largely dormant over the winter months and the weather often dark and miserable, even a small splash of bright and colourful flowers can make a big impact amid all the gloom. In many ways hanging baskets and outdoor decorations really come into their own at this time of year – so it’s well worth the trouble of planting one or two as part of your Festive preparations. It’s always difficult to predict exactly what will be in bloom for Christmas Day itself, since the weather can make a big difference to how ‘early’ or ‘late’ things are, so the best approach is to use a range of plants which flower at different times. That way you ought to have something in the basket looking its best on the actual day, and the succession of flowers should guarantee that you get a good display throughout most of the winter months as well. For hanging baskets, you might also like to consider ornamental sedges (Carex) to add a little texture and ivies to soften the edges of the basket and provide some ‘dangle’ to the display. Variegated ones are particularly effective used in this way, but do remember that they tend to be a little less hardy than their plain cousins, so watch out for frost or bad weather. All of these plants are pretty hardy, which means they don’t really need too much in the way of care to keep them happy. If you keep your baskets and decorations watered – but not waterlogged – and are ready to give them some protection or move them in high winds or heavy frosts, you shouldn’t go far wrong. A striking pot or container can often be the starting point for a really impressive outdoor decoration. Quite often the shape, colour or texture of your pot can prove the inspiration for the whole display, so taking a while to find the right one before you get too involved with selecting your plants is time well spent. It’s just as important to aim for a succession of early to late flowering plants for outdoor decorations as it is for hanging baskets, for exactly the same reason. Depending on the overall feel you’re trying to achieve, outdoor decorations can make use of taller plants than you’d generally find in hanging baskets. This is particularly good news if you’re working with a yellow or cream colour scheme because it lets you pick probably the best and most dependable winter flowering plant of all – Mahonia. japonica. Putting out delicate scented, yellow flowering branches above its spiky holly-like leaves from mid-autumn into the early days of spring, it’s a hard act to beat! Under-planting the main display with suitable bulbs – the likes of crocuses, snowdrops and miniature daffodils (some kinds are scented) – can be another very effective way of extending the life of your Christmas decoration into February and March. Although you would normally try to plant your baskets and decorations in September or October to give them a chance to get themselves properly established by the start of winter, if you’ve left it a bit late don’t worry. The choice in your local garden centre may not be quite so extensive in late November or December, but if you pick fairly large plants, you’ve still got time to put together a display that will do you proud at Christmas. With a few well-selected plants, a suitable container and a bit of imagination, winter hanging baskets and displays can add a whole new dimension to your Festive outdoor decor. Perhaps best of all, they’re great fun to do. Unwanted Christmas Gifts: What to Do?